Most analysts have deemed Richard Nixon’s challenge to the judicial liberalism of the Warren Supreme Court a failure—“a counterrevolution that wasn’t.” Nixon’s Court offers an alternative assessment. Kevin J. McMahon reveals a Nixon whose public rhetoric was more conservative than his administration’s actions and whose policy towards the Court was more subtle than previously recognized. Viewing Nixon’s judicial strategy as part political and part legal, McMahon argues that Nixon succeeded substantially on both counts. Many of the issues dear to social conservatives, such as abortion and school prayer, were not nearly as important to Nixon. Consequently, his nominations for the Supreme Court were chosen primarily to advance his “law and order” and school desegregation agendas—agendas the Court eventually endorsed. But there were also political motivations to Nixon’s approach: he wanted his judicial policy to be conservative enough to attract white southerners and northern white ethnics disgruntled with the Democratic party but not so conservative as to drive away moderates in his own party. In essence, then, he used his criticisms of the Court to speak to members of his “Silent Majority” in hopes of disrupting the long-dominant New Deal Democratic coalition. 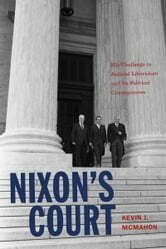 For McMahon, Nixon’s judicial strategy succeeded not only in shaping the course of constitutional law in the areas he most desired but also in laying the foundation of an electoral alliance that would dominate presidential politics for a generation. Why Isn't Al Gore President?